"...there Joshua divided the land unto the children of Israel according to their divisions"
This page shows the areas in the north that were in each of the tribe's region, and maps them to the sites that are featured in BibleWalks.com. This page describes the regions of the Tribes of Israel in the north (Galilee) section. It maps the cities of each tribe, as described in the Bible, to the sites that appear in BibleWalks.com. The division of the land of Israel is described in the book of Joshua (Chapter 18: 1-10). this event happened in Shiloh, and Joshua sent them to survey the land and return with their recommendations. "And the whole congregation of the children of Israel assembled themselves together at Shiloh, and set up the tent of meeting there; and the land was subdued before them... there Joshua divided the land unto the children of Israel according to their divisions". The following map shows the boundaries of the initial distribution of the Northern part of Israel among the Tribes. The map is based on the book of Joshua. The tribe of Levy is not shown, since it was settled in certain cities among the other tribes. The map shows the boundaries between the tribes, and selected sites within the areas of the Tribes. Click on one of the ●Blue sites to get more information. Click on the tribe's name to get to the Biblical reference. The division of the land of Israel is described in the book of Joshua (Chapter 18: 1-10). It happened in Shiloh, and Joshua sent them to survey the land and return with their recommendations. 1 "And the whole congregation of the children of Israel assembled themselves together at Shiloh, and set up the tent of meeting there; and the land was subdued before them. 3 And Joshua said unto the children of Israel: 'How long are ye slack to go in to possess the land, which HaShem, the G-d of your fathers, hath given you? 4 Appoint for you three men for each tribe; and I will send them, and they shall arise, and walk through the land, and describe it according to their inheritance; and they shall come unto me. 5 And they shall divide it into seven portions: Judah shall abide in his border on the south, and the house of Joseph shall abide in their border on the north. 6 And ye shall describe the land into seven portions, and bring the description hither to me; and I will cast lots for you here before HaShem our G-d.
9 And the men went and passed through the land, and described it by cities into seven portions in a book, and they came to Joshua unto the camp at Shiloh. 10 And Joshua cast lots for them in Shiloh before HaShem; and there Joshua divided the land unto the children of Israel according to their divisions". The Biblical texts in Joshua map the regions of the tribes in the north of Israel, according to the book of Joshua. The sites already featured in BibleWalks.com are hyper-marked, and you can click on the word to get to the detailed site. We intend to feature more of the sites, so most of them will be covered. This text, describing the land of the tribe of Asher, lists the cities in their area. Note that the eastern border shifted eastwards after Solomon's pact with Hiram, on the expense of Naftali. 24 "And the fifth lot came out for the tribe of the children of Asher according to their families. This text described the borders of the Tribe of Zebulun (Zevulun). (10) And the third lot came up for the children of Zebulun according to their families; and the border of their inheritance was unto Sarid. (11) And their border went up westward, even to Maralah, and reached to Dabbesheth; and it reached to the brook that is before Jokneam. (12) And it turned from Sarid eastward toward the sunrising unto the border of Chisloth-tabor; and it went out to Dobrath, and went up to Japhia. (13) And from thence it passed along eastward to Gath-hepher, to Ethkazin; and it went out at Rimmon-methoar unto Neah. (15) and Kattath, and Nahalal, and Shimron, and Idalah, and Beth-lehem; twelve cities with their villages. 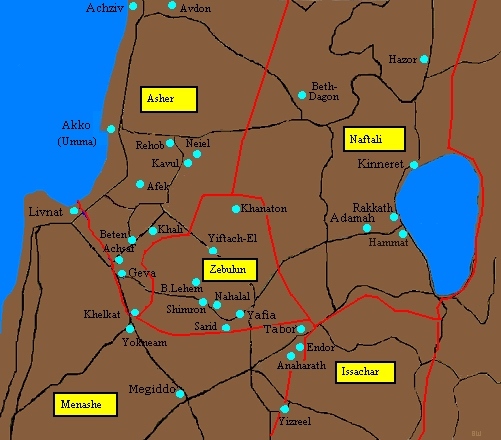 (16) This is the inheritance of the children of Zebulun according to their families, these cities with their villages. 32 The sixth lot came out for the children of Naphtali, even for the children of Naphtali according to their families. 33 And their border was from Heleph, from Elon-beza-anannim, and Adami-nekeb, and Jabneel, unto Lakkum; and the goings out thereof were at the Jordan. 34 And the border turned westward to Aznoth-tabor, and went out from thence to Hukok; and it reached to Zebulun on the south, and reached to Asher on the west, and to Judah at the Jordan toward the sunrising. 38 and Iron, and Migdal-el, and Horem, and Beth-anath, and Beth-shemesh; nineteen cities with their villages. 39 This is the inheritance of the tribe of the children of Naphtali according to their families, the cities with their villages. 17 The fourth lot came out for Issachar, even for the children of Issachar according to their families. 22 and the border reached to Tabor, and Shahazim, and Beth-shemesh; and the goings out of their border were at the Jordan; sixteen cities with their villages. 23 This is the inheritance of the tribe of the children of Issachar according to their families, the cities with their villages. 10 southward it was Ephraim's, and northward it was Manasseh's, and the sea was his border; and they reached to Asher on the north, and to Issachar on the east. 11 And Manasseh had in Issachar and in Asher Beth-shean and its towns, and Ibleam and its towns, and the inhabitants of Dor and its towns, and the inhabitants of En-dor and its towns, and the inhabitants of Taanach and its towns, and the inhabitants of Megiddo and its towns, even the three regions. 12 Yet the children of Manasseh could not drive out the inhabitants of those cities; but the Canaanites were resolved to dwell in that land. 3 And the children of Israel gave unto the Levites out of their inheritance, according to the commandment of HaShem, these cities with the open land about them. 25 And out of the half-tribe of Manasseh, Taanach with the open land about it, and Gath-rimmon with the open land about it; two cities. 29 Jarmuth with the open land about it, En-gannim with the open land about it; four cities. 31 Helkath with the open land about it, and Rehob with the open land about it; four cities. 32 And out of the tribe of Naphtali, Kedesh in Galilee with the open land about it, the city of refuge for the manslayer, and Hammoth-dor with the open land about it, and Kartan with the open land about it; three cities. 33 All the cities of the Gershonites according to their families were thirteen cities with the open land about them. 35 Dimnah with the open land about it, Nahalal with the open land about it; four cities. Carta's Atlas of the Bible - Y. Aharoni [Carta Jerusalem 1974] - Shop for this must-have book.